It is now 3:00 p.m. and it is still snowing. Since I have some people coming to see the house tomorrow, I decided to get back out and tackle the rest of the shoveling and also dig my car out so that I can leave while they are here. Forty five minutes later, I am sweating and I have downed about 20 ounces of water in five minutes (rare for me). I'm glad that I skipped my workout this morning--between the two shoveling efforts, I have gotten about an hour and fifteen minutes of cardio. My motto is that one should never physically exert oneself more than necessary, so I will remain stationary for the rest of the day. Picture it: New York City, February 1964. 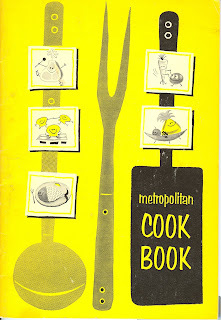 The Metropolitan Life Insurance Company is on the verge of launching the latest version of their cookbook. This time, things would be different, they thought. Forget photographing the food--they needed a new approach. 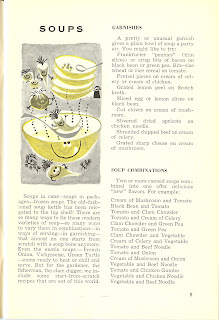 They would hire an illustrator to bring the recipes to life. The result? 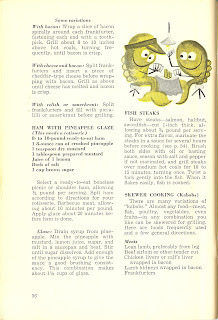 This masterpiece, full of happy steaks and fish cavorting with onions and bottles of ketchup. 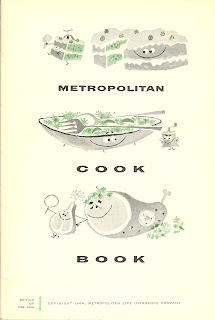 In this cookbook, everything from a slice of cake to a pepper mill has a face, smiling at you as you dig into the delicacies created by the authors of the Metropolitan Cook Book. 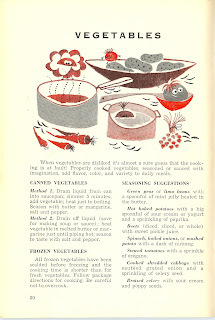 Happy vegetables jumping into a happy bowl of soup-I think that Tracy Tomato is about to do a canon ball, so Connie Carrot had better watch out. Mr. Peter Parsnip looks on in amusement from the safety of the table below. 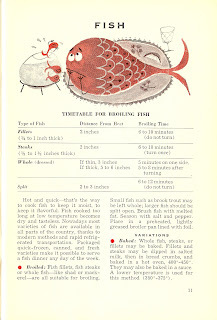 This fish seems a little bummed about being on a platter. Why the glum face, Frankie Fish? You have a parsley garnish--what more could a fish want? I love how the three other fish that get to stay in the water are totally taunting Frankie. Here's where things begin to get disturbing. So we have a fish--let's call him Farley--wearing a bib and presiding over a table full of food. 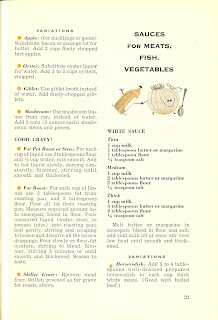 It appears that some of the food may very well be fish-based. Is he going to eat the fish? Are we meant to think that Farley is eating himself or just his friends? He seems pretty happy with his parsley hat, so maybe he's planning to eat his nemesis, Colin Catfish? I don't really understand this one. Is it a pile of steaks (ham?) 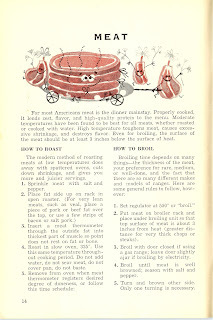 on some kind of trailer or wagon being pulled by other steaks wearing frilled white paper chop hats and holding bouquets of parsley? Is it supposed to be like a float in a parade? What are they so excited about? Being eaten? 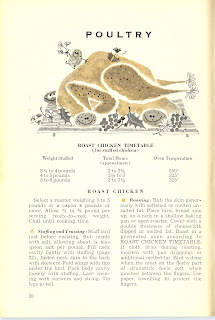 Do the squiggly lines indicate that the meat has been cooked, or are we looking at raw meat on the move? Oddly, the chicken does not have a face. 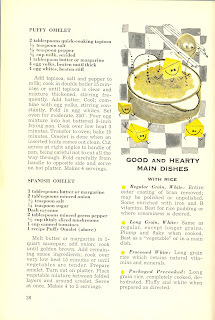 Instead, there are a lot of smiling potatoes hanging around on this platter and the one at the top appears to be using the chicken breast as a slide. That is one fat chicken--anyone want to bet that there is a farmer lurking around the corner, just waiting for the right moment to make his move? What is going on here? 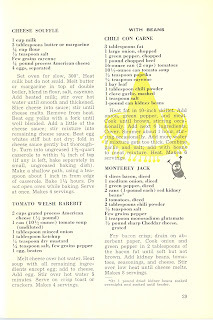 A happy onion holding a spoon is being taunted by a bottle of mustard with a cap that looks like a top hat? What does that have to do with white sauce? 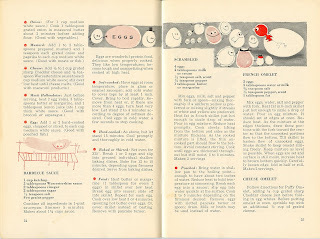 This illustration of Eggtown is quite disturbing. Some of the eggs are happy, innocently going about their daily lives. In the middle, we have Elaine Egg, her large sun hat, and her egglet, Eve. Then, at the right, a giant dinosaur egg is hatching as other eggs look on--some seem angry, like Alistair, others like Juan seem happy, and still others like Julian seem nervous and unsure about what is happening. 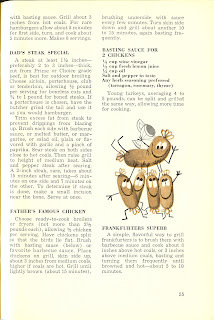 On the same page, but a world away, Frederick Frankfurter smiles nervously as he rotates over a grill. This one is sort of mysterious as well. I guess that this is a bowl of rice--being carried by three cheese wedges? Why is the one wedge on top of the rice instead of helping? What a lazy bum. One of the eggs from Eggtown had to step in to help carry the chopsticks. I don't even know what to say about this one. What is going on? What is that thing in the cloud supposed to be? Why is a radish walking on top of a bowl of potatoes? What are those little lines supposed to be? What do you get when you gather bacon, a fried egg, some mustard, relish, lemon slices, a frankfurter, and some tins of anchovy and tuna? You get a heck of a fun sandwich party, that's what. 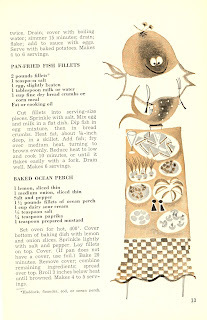 If I saw a tin of anchovies with legs and arms, I think I would run away. 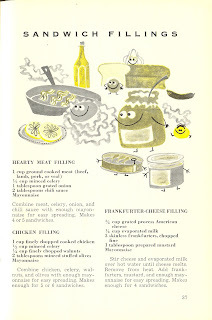 Regardless of what you think of the illustration, the recipe for "Frankfurter-Cheese Filling" sounds positively revolting. What is on this sandwich? A drumstick, some olives, a pickle, an egg, and some lettuce? I think that Mama Cake needs Supernanny. The cupcakes are going crazy and she looks frazzled. This cake appears to be wearing a bad toupee. 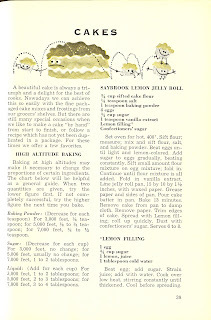 Also, a cake licking itself is SO unappetizing. I would take a moment to check my cookie jar if I were you guys--make sure that your cookies aren't escaping via ladder, taking their luggage (? ), and running away. Is this apple skiing with forks on top of an apple pie? 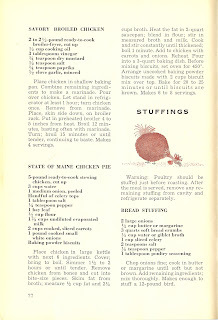 Is it about to eat itself in a pie? 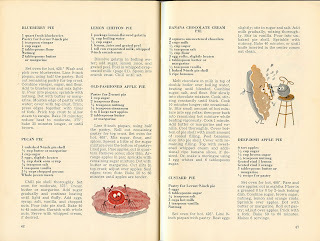 And how about that poor pie on the right getting hit in the face with another pie by a demented egg in a chef's hat? 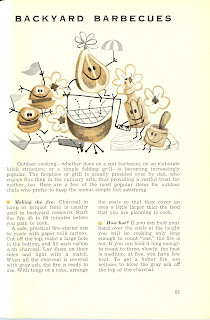 These steaks and burgers sure seem happy to be near a grill and that bottle of ketchup is happily tending the spit while the jar of mustard looks on, relaxing. Do you guys get the joke? Fish steaks? Playing for stakes? Hahahahahaha! Love the visor. Have a great weekend, gentle readers! Poor Kenna couldn't even get off of the porch to do her morning business, so I knew that I would have to get moving on the shoveling. See that little bump in the middle of the photo? That's the mini Weber grill. Most of my measurements read about 18-20 inches, although there is way more in places where the snow has drifted. In any case, 18-20 inches is quite enough and it kept me from being able to go out my front door. So, I shoveled my way out the back, opened the gate a little, and trudged through the snow until I got to the front of the house. I haven't even gotten to the car yet, and I might not. I'm not going anywhere for a while and we're supposed to get a little sun later today, so I'll wait until later to decide when to work on this project. This one is just for Father of Ken--I didn't do a single thing to make it easier for the postal person to get to my mailbox. This is payback for not taking the packages that I left for them last week, hanging in a plastic bag from the mailbox. Instead of taking the packages, they stuffed my new mail into the plastic bag and drove on. So, yeah, this has been fun. Thank God for neighbor Jeff, who has kindly plowed in front of my car twice--once last night and again this morning. That cuts down on my work, so he'll probably be getting some cookies soon. The county plow has been by once this morning, but it isn't clearing the roads, just keeping the snow from accumulating too much. There is at least half of an inch of snow and icy slush on the road and I will not be venturing out in that. This week's Favorite Thing is white vinegar. I know that may sound strange to you, but hear me out. 2. It is one of the best deodorizers I have ever found. 3. It polishes chrome like nobody's business. 4. It is great for grade school science experiments. Contrary to Late Grandfather of Ken and Father of Ken's opinions, white vinegar does not rid dogs of fleas. In fact, it will make your Boston Terrier hyperventilate and never trust you again. Poor Corkey. It does, however, clean and deodorize nearly everything in or around your home for pennies and it makes everything smell fresh, not vinegary. 1. The neutralization of drawers and cabinets in cool, but somewhat smelly old furniture. 2. The neutralization of Leah's kitchen and living room following a lasagna overflow mishap in January. 3. Cleaning and polishing the chrome fixtures in the bathrooms and kitchen of my house when I took cleaning duties over from the Disgustingtons. 4. Quickly freshening the garbage disposal so that it smells nice. 5. Cleaning and freshening the microwave--put some white vinegar in a bowl, microwave it for 30 seconds, then use a cloth dipped in the vinegar to clean the inside of the microwave. 6. 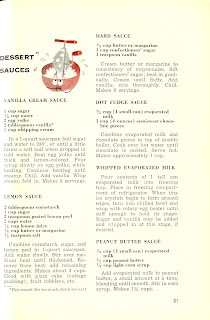 Works as a substitute for buttermilk when you mix it with regular milk. Great for other cooking and baking applications, too. And best of all, it is SO inexpensive! You can get a huge bottle of it for a few dollars and you can use it for so many things. White vinegar is awesome. You know I'm right. 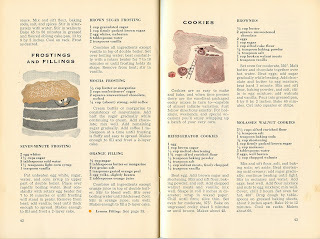 You all know how much I love gelatin-based recipes. Away we go! 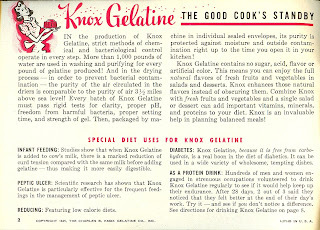 Seriously, the first page in, and they're talking about things like peptic ulcers and "reducing." 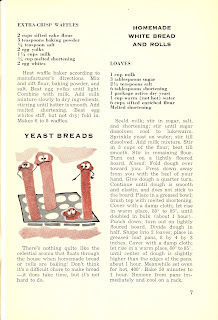 I certainly don't doubt that these recipes will inspire people to "reduce." 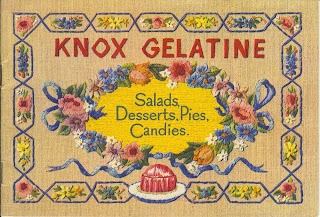 In addition to creative recipes involving gelatin and strangely styled photographs, this cookbook also offers tag lines like the ones below. 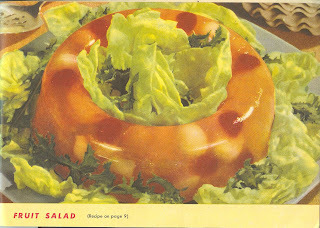 "Perfection Salad--How the men go for this one!" 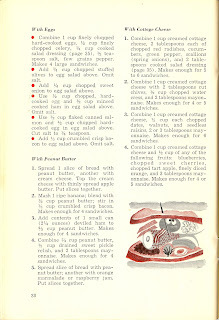 Here we have the recipe for "Winter Salad--Grand sandwich filling--excellent for diabetic diet!" 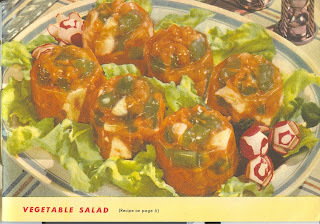 This is a combination of gelatin, American cheese, stuffed olives, celery, and green pepper along with whipped cream or evaporated milk. The only way that this would be excellent for anything is if you threw it at your worst enemy. 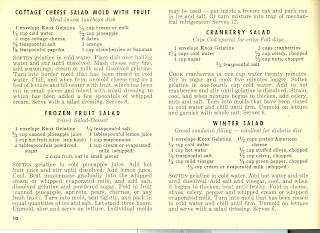 Yummy fruit salad--I just can't tell you how much I would love to dig right in. 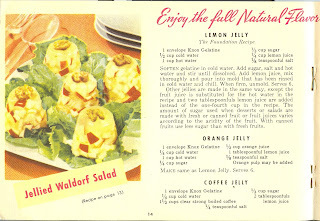 Even better, one of my favorites--"Jellied Waldorf Salad." Ugh. 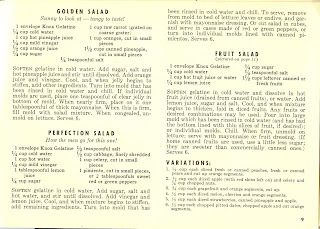 If the Waldorf salad isn't for you, perhaps you would like to try some "Coffee Jelly."